This book sounds SO good. My favorite parts of the Larsen book had nothing to do with the serial killer. It was such a fascinating look at the city itself. Thanks for the review. Will definitely be picking this up. This sounds fascinating! I had heard of the Chicago fire but I had no idea what actually caused it. Actually the Great Chicago Fire was about 50 years earlier. The fire caused by the blimp accident was relatively small and contained, but was only the beginning of a really turbulent couple of weeks. 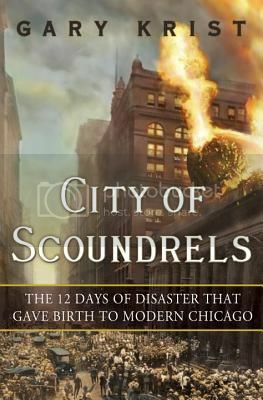 Man, Chicago just has this tangibly scandalous history! I’m pretty sure I need this one stat, will look up the audio book version as well. I just this week had added this to my audiobook list to download from the library. This description makes it sound even more interesting than their limited description. Thanks for the review.